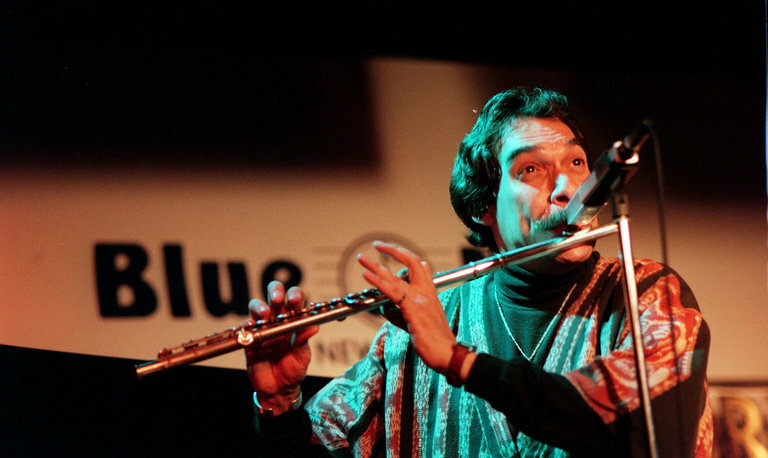 Dave Valentin, a Grammy Award-winning Latin jazz flutist who recorded dozens of albums and performed on six continents, died on Wednesday in the Bronx. He was 64. The cause was complications of a stroke and Parkinson’s disease, said his manager, Richie Bonilla. Born in the Bronx to parents who came from Puerto Rico, Mr. Valentin was playing conga and timbales professionally by the time he was 10. As a teenager, he became attracted to a girl who played the flute and, to better court her, switched instruments and taught himself to play. He went on to become one of the pre-eminent flutists in Latin jazz. He won a Grammy for best Latin jazz album in 2003 for “The Gathering,” by the Caribbean Jazz Project, an album that also featured the vibraphonist Dave Samuels. David Joseph Valentin was born in the South Bronx on April 29, 1952, to parents who came to New York from a fishing village near Mayagüez, P.R. His mother was the former Sylvia Ramirez. His father, Jorge, a steward in the merchant marine, brought home bongos and congas from Brazil, which Dave began practicing on when he was 5. He took piano lessons when he was 9 and was playing percussion for $10 a gig when he was 10. His junior high school had a school band and a jazz band, an orchestra, a chorus and seven music teachers, one of whom, Stuart Soffer, recommended him to the High School of Music and Art (now the Fiorello H. LaGuardia High School of Music and Art and Performing Arts in Manhattan). After graduating, he studied under the acclaimed jazz flutist Hubert Laws, who became his mentor. He also studied at Bronx Community College before becoming a music teacher. His first album as a leader, “Legends,” was released in 1979 on the GRP label, with which he had a long and fruitful relationship as both a leader and a sideman. In addition to releasing numerous albums under his own name, he recorded with the singers Patti Austin, Chris Connor and Nnenna Freelon, the guitarist Lee Ritenour, the pianist McCoy Tyner’s Afro-Cuban All-Stars and many others. He also toured with the percussionist Tito Puente and was music director of his Golden Latin Jazz All-Stars. After suffering a stroke in 2012, he convalesced in a rented bungalow in the Harding Park section of the Bronx, surviving without savings or health insurance and dependent largely on donations, many of them handled by the Jazz Foundation of America. He eventually moved to a nursing home. He is survived by a brother, George. Mr. Valentin delighted in recounting how he became a flutist.